This is my first year trying to grow anything, so obviously I have no idea what I'm doing. I've read multiple articles and watched many gardening videos on growing cabbages in Georgia, and I recently transplanted my cabbages last week into soil mixed with peat moss and compost. Espadas wrote: This is my first year trying to grow anything, so obviously I have no idea what I'm doing. 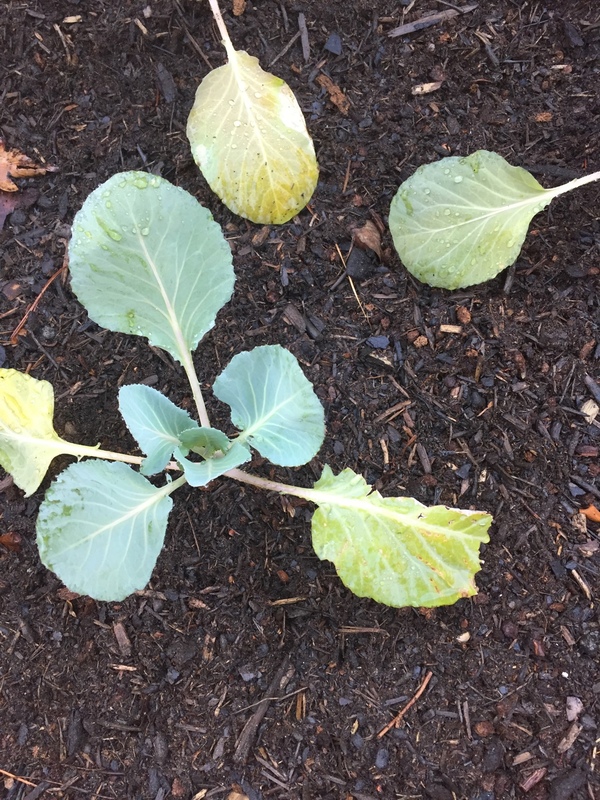 I've read multiple articles and watched many gardening videos on growing cabbages in Georgia, and I recently transplanted my cabbages last week into soil mixed with peat moss and compost. Yellow leaves might be a symptom to over watering, but since they are also wilting it could be something else.. How does the yellow leaves look? Can you add pictures? Also: What type of Cabbage plants do you have? What size are the plants now? Nice to hear that you are learning to grow food. We will support you through your first season! What else do you grow? Thank you! Here are some pictures. I'm seeing one of them has a lead that looks half eaten, some others have small holes. It rained over night, but I didn't water them yesterday because it rained earlier in the week and I watered them after adding coffee grounds a couple of days ago. That actually looks more like some nutrient deficiency (affecting the older leaves).. So if you just transplanted them I think that they will catch up and be fine. Make sure to check both sides of the leaves for cabbage flies and aphids regularly. I always cover my cabbage plants with a net to keep pests away from them, but right now I still have my cabbage indoors. Good luck, and keep us posted. How much are nets? We literally just built the bed a week ago with spare wood, so maybe I can find something to go over it. Espadas wrote: How much are nets? We literally just built the bed a week ago with spare wood, so maybe I can find something to go over it. You can use a lace curtain or fiber cloth if you have any of that. Should I cut away the dying leaves, or just let the plants be for now? Espadas wrote: Should I cut away the dying leaves, or just let the plants be for now? You can cut them of! So I dug up my cabbages because they were deteriorating since I transplanted them. Turns out the drainage in the garden was pretty much nonexistent, so the lower soil was staying wet. I took the remaining biodegradable pot off of the roots and improved the drainage system underneath the soil, then I added fresh soil and plant food and replanted all of my food. Hopefully I'll see an improvement. Espadas wrote: So I dug up my cabbages because they were deteriorating since I transplanted them. Turns out the drainage in the garden was pretty much nonexistent, so the lower soil was staying wet. I took the remaining biodegradable pot off of the roots and improved the drainage system underneath the soil, then I added fresh soil and plant food and replanted all of my food. Hopefully I'll see an improvement. Great! That should do the trick. Great to see that your cabbages are recovering! It looks like they are doing really good! What else do you have in your garden? I planted onions next to these. They're looking pretty atrocious. I have marigold seeds freshly planted and watermelon seedlings waiting to be transplanted. That sounds like a nice mix! I am expecting my watermelons to sprout any day now. :) Onions.. I have not started mine yet, so I guess that you have time to start new ones? These onions were from my fiancé's season last year that didn't grow then, but they're apparently demanding a comeback this season. They seem to want to do something this year, so we are going to try it.